Since 110-car-loading grain terminals began being built in earnest in the 1990s in North Dakota, a common rule of thumb for grain handlers is that the heavilyfarmed state could produce enough crops to support a rail terminal every 20 miles in every direction. One of the gaps in coverage across the state was near Pillsbury, ND, about 60 miles northwest of Fargo. The Arthur Companies, a family owned grain operation currently celebrating its 110th year in business opened a 2-millionbushel, all-steel terminal there (701-945-9503), along a Burlington Northern Santa Fe (BNSF) main line, in 2016. In addition to the terminal elevator, the site includes a 10,000-ton fertilizer plant and an 11,000-foot loop track. • W Design Associates, McCook, NE (308-345-2370), performed design and engineering work on the terminal. • Hope Electric, Hope, ND (701945-2460), served as electrical contractor and supplied PC-based control systems. • R&R Contracting, Grand Forks, ND (701-772-7667), built the loop track. According to Knott, it’s the first loop track at a grain facility in North Dakota to utilize high-carbon steel ties. “This type of track requires less ballast, and gauge problems are eliminated, because the tie is stapled directly to the rail,” he says. The fertilizer plant was the first part of the facility to be built, with construction starting in August 2014 and finished in March 2015. That month, work began on the grain elevator, which went operational in May 2016. Storage at Pillsbury consists of two east-west rows of steel tanks: six GSI 72-foot-diameter flat-bottom corrugated steel tanks holding 360,000 bushels of dry grain each, and six GSI 21,000-bushel hopper tanks for wet storage or segregation. 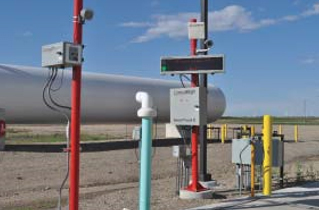 The big tanks stand 80 feet tall at the eaves and come equipped with outside stiffeners, 12-inch GSI X-Series sweep augers, 12-cable Rolfes@Boone grain temperature monitoring systems, and Monitor Technologies radar-type level indicators. A pair of 50-hp GSI centrifugal fans provide 1/10 cfm per bushel of aeration through in-floor ducting. The hopper tanks stand 24 feet in diameter and 62 feet tall at the eaves, with 45-degree steel hoppers. Because they are intended for short-term storage, they each are equipped with 10-hp GSI axial fans but no grain temperature monitoring. Truck traffic through the facility is routed on a single one-way path for fast receiving and to avoid truck lines as much as possible utilizing CompuWeigh’s SmartTruck RFID system. Incoming trucks are routed past an InterSystems truck probe adjacent to the office building, then onto a 110-foot Rice Lake pit-type scale. After being weighed in automatically based on that truck’s unique RFID tag, a CompuWeigh SmartView digital display automatically routes drivers to one of two 800-bushel enclosed mechanical receiving pits based on the commodity and grade factor requirements saved in the CompuWeigh system. CompuWeigh SmartTruck system guides drivers through the Pillsbury property. In the background, a propane tank supplying a 7,000-bph Zimmerman grain dryer. After depositing their grain, drivers continue onto another 110-foot Rice Lake outbound scale with a CompuWeigh OTP-4700 outdoor ticket printer to provide scale receipts. The receiving pits feed a pair of GSI 30,000-bph legs with two rows each of 20×11 Maxi-Lift HD buckets mounted on 44-inch Goodyear belts. These legs are enclosed in a Warrior 20-foot-x-60-foot-x-180 foot main receiving tower, along with the loadout leg. The legs deposit grain into an eight-duct Schlagel rotary double distributor. From there, grain travels via a series of 30,000-bph GSI drag conveyors out to storage. Two of the three drag conveyors are supported on a 240-foot, 11-foot-wide Warrior box bridge; the other by a 240-foot, 7-foot-wide handrail truss. A 200foot, 6-foot-wide Warrior catwalk supports the drag conveyor over the row of hopper tanks. The hopper tanks empty onto an above-ground 30,000-bph GSI drag, while the big tanks empty onto 60,000bph GSI enclosed belt conveyors. All lead to a 60,000-bph GSI loadout leg equipped with three rows of 20×11 Maxi-Lift HD buckets on a 64-inch Goodyear belt. Prior to loadout, the operator has the option of running grain through one of two InterSystems gravity screeners, one rated at 35,000 bph and the other at 50,000 bph. 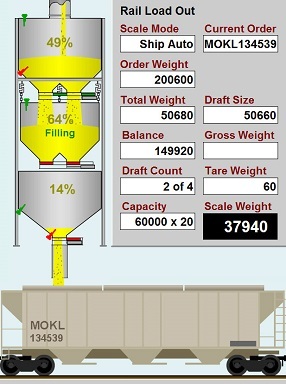 Rail loading is handled by an 80,000-bph Warrior bulkweigher fully integrated with a support structure, hydraulic spout, control room, Gamet sampler, and a CompuWeigh GMS failsafe control system. Workers atop railcars are protected by a 500-foot trolley-type fall protection system fabricated by Warrior. Knott says 110-car shuttle trains have been loaded as quickly as eight hours. The facility also includes a 7,000bph propane-fired Zimmerman grain dryer. Propane is run through a heavyduty vaporizer before being introduced to the burners. The dryer is fed by a 15,000-bph GSI wet leg supported by a Warrior 12-foot-x-12-foot-x-140-foot support tower. The entire property is lit by energy efficient LED lights.